* Internal hidden charging line--No more problem of charging or placing your Airpods. * Unique logo hole design can help you better manage your phone charging line--Make things more tidier. 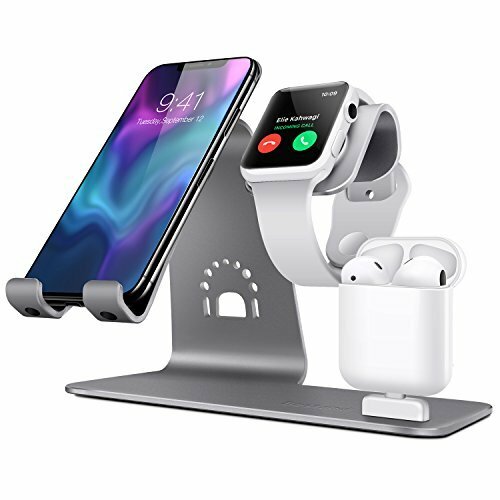 * Portable iPhone, Apple Watch stand and Airpods charger can be conveniently used in home or office. * Could be used for all versions of the Apple Watch/Airpods/iPhone/Cell phone simultaneously. * Portable stand provides a comfortable viewing angle, not only for your apple watch but also function as a fashionable stand for your phone and tablet. Easily to carry. * It's also a great nightstand or desktop for you. No longer confusion, you can put glasses and phone and iWatch together. NOTICE: Stand only, Devices(Apple Watch) and Airpods not included. [Airpods Charger] Convenient design for charging Airpods. Special Hidden line design provides you a tidy charging stand. [3 in 1] 3 in 1 design which can not only charge Airpods, but also place cell phone and Apple Watch. [Durable and Sturdy] Made of aluminum alloy, while the bottom is provided with anti-skid silicone pad which provides you durable and sturdy stand. [All for Tidy]The design with unique logo hole can better manage the long charging line. [Compatibility] It is specially designed for mainstream cell phones and Apple Watch / Airpods / iPad/ iPhone/ Samsung Galaxy S7 and so on. [More stable] Anti-slip rubber mats offer the best protection, avoids scratching the iPhone watch docking station.